There are few contractors that don’t appreciate the value of what marble tile can do to a project. Even on the lowest budget, marble tiles have the ability to instantly increase the value of structure. This is all thanks to its longevity not to mention its beauty that brings a certain level of sophistication and style that has lasted throughout the centuries. Marble screams elegance and prosperity—synonymous with royalty, marble is a type of building material that is associated with more upscale builds. It’s no wonder that it’s one of the more popular choices among building contractors and architects. They want to build something that will last long after they’re gone and installing marble tiles are just the kind of finishings that buyers are going after. Don’t Be So Quick to Make a Purchase on Your Supply of Marble Tile! 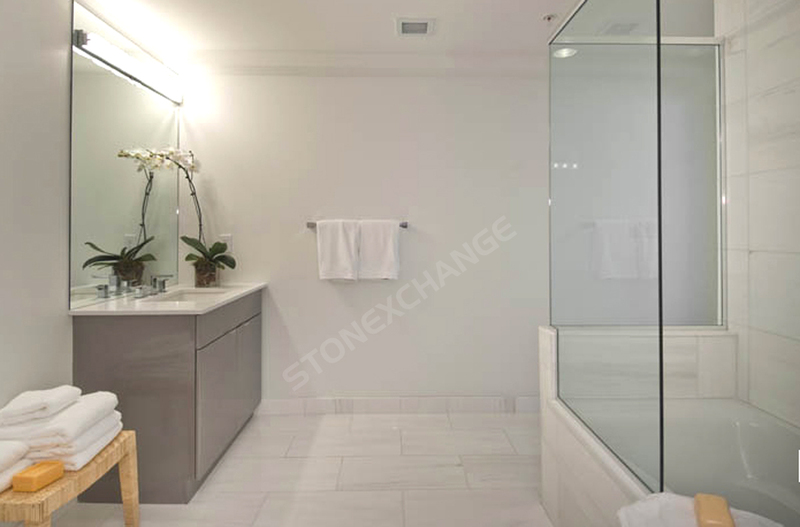 Before you start investing your hard-earned money into your next building project with marble tiles, you should know everything there is to know about the product, both the advantages and disadvantages. This knowledge will serve you well when selling to your buyers. The more you know about the product you’re selling, the more your customers are likely to trust and rely upon your expertise and place recurring orders. Almost every experienced contractor knows that upgrading kitchens and bathrooms are the key to increasing the value of a residential or commercial build. Since kitchens typically have more square footage, the bathroom is usually the first space in a build that contractors may invest in because the square footage is minimal. Therefore, the cost for marble flooring will be as well. Marble tiles are naturally built to last. – Marble tiles are basically rocks! Almost everyone has an idea how durable stone is. So to incorporate this into a build as a finishing feature can only help the owner from needing to spend money on replacement tile. Uniquely designed by nature. – Marble tiles are organically forged within the earth by way of pressure and an immense amount of heat from the earth’s core. Some of it will need to be mined, but through tectonic plates coming together from earthquakes throughout the years, some of this beautiful stone has emerged from the earth making it slightly easier to mine. Marble tiles are waterproof. – Marble tiles are great for bathroom flooring because of its ability to hold water at bay. Should the sink or tub overflow, marble tile will be able to keep the water from seeping into the floorboards that could cause rot. Marble tile is porous. – While marble tiles are waterproof, they’re still quite porous. This means that that the surface is solid enough to withhold water, however, the surface is porous enough to absorb any spills that will ultimately result in discoloring the tile and possibly giving it another look altogether. Again, this is something you might be able to get away with in the darker shades, but not so much with the lighter tones. As a result, marble tile will require maintenance. By applying an annual sealant, you can prevent spills from leaving a lasting stain. Shop online for the type of sealant you’d need to stock for your customers here. Marble tile can be slippery. – This is the issue with using marble tile for bathroom flooring: It’s great because it’s waterproof, yet because of its lustrous surface, it can also be quite slippery. While marble tiles can make a bathroom look showroom ready, we recommend owners to lay slip-proof rugs to prevent an unfortunate injury—especially for commercial owners. Good marble tile can be costly. – If marble tiles were cheap everyone would have them and they wouldn’t be so covetous…because everyone would have them. Also, marble isn’t cheap to acquire. Much work goes into attaining it. The labor alone is expensive. Therefore, so will the end cost. With that said, if you can find the right kind of wholesale marble distributor like Nalboor Tiles, you stand a good chance on acquiring your bulk order of quality marble tiles at a discount rate per unit. At Nalboor Tiles, we pride ourselves in being a top-notch distributor of fine marble flooring. We mine our marble from our own quarry in Turkey and other continents overseas. Because marble has many unique swirling vein patterns and colors, one tile can look completely different from another if it’s not cut from the same mine. Many marble wholesalers will get their material from anywhere they can get it as long as it’s at an affordable price. The drawback with getting marble tile from just anywhere, even if it’s the same name is that you’ll likely find yourself with a hodgepodge of different grades of color. When you’re trying to install flooring, especially for a small area like the bathroom, it’s important to install a set of tiles that have the same kind of veining flow. When you’re installing marble tile with darker colors, this becomes quite obvious. You might be able to get away with this when it comes to lighter colors, but it’s a gamble that we suggest you don’t take. Get a FREE SAMPLE and Place Your Order Today! See for yourself how well the quality of Nalboor Tiles’ products are. Order a FREE SAMPLE online. You can also place a direct order online through our website, or call and speak to one of our representatives to learn more information about the type of tile that you’re interested in. Call 305-501-4548 or ask us a question online.